Concept map is a graphic method that can be used to organize and represent knowledge. It helps any individual or group to describe and structure ideas in a visual form. Concept mapping is used for many destinations -- project management, strategic planning, market analysis, decision making, etc. 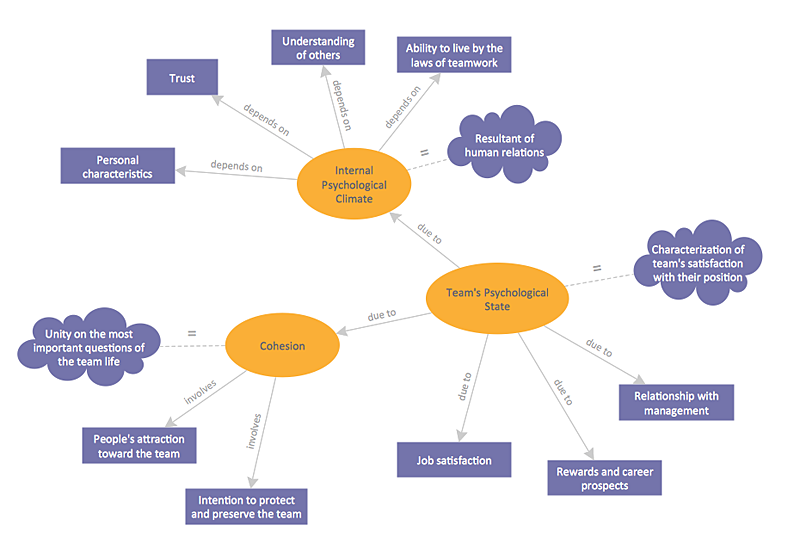 Concept mapping is valuable technique because it helps people to think more effectively as a team however maintaining the individual ideas. It helps teams to manage complex knowledge keeping both general conception and details. ConceptDraw DIAGRAM allows you to build Concept Maps easily using the Concept Map solution. Open a ConceptDraw DIAGRAM new document and select the Concept maps library. Add a central Concept map object to the document page by dragging it from the library. You can add text to your object. To start adding text, click an object and then, type your desired text. Add the related objects and connect them to the center concept using Direct Connector tool. . To connect elements using this tool, drag the connector from one connect dot to another. More important ideas should be put nearer to the center and less important ones closer to the edge. Identify the relationship between the concepts by adding text to connectors. Adding text to connectors the same as to other objects. Result: Since concept maps visually present the relationships among a set of a logically connected items, it is widely used as a learning and teaching technique.